Teach protein structure with models and activities. 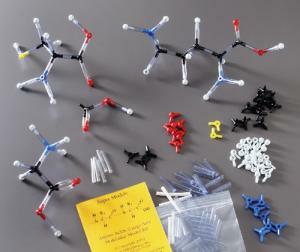 You can construct all 20 amino acids in both the L and D forms, as well as make peptide bonds and polypeptides with these flexible and durable model parts. The kit includes 29 carbons, 16 oxygens, 54 hydrogens, three sulfurs, 11 nitrogens, and 109 connectors for single and double bonds, as well as an instruction booklet.